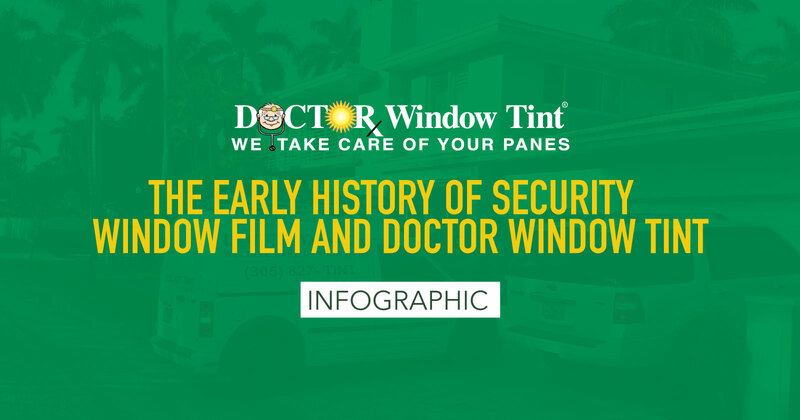 For many people the history of security window film may not instantly elicit as much excitement as it does for us at Doctor Window Tint. However, we guarantee that after hearing our story, you will certainly be looking at window film in a different light. 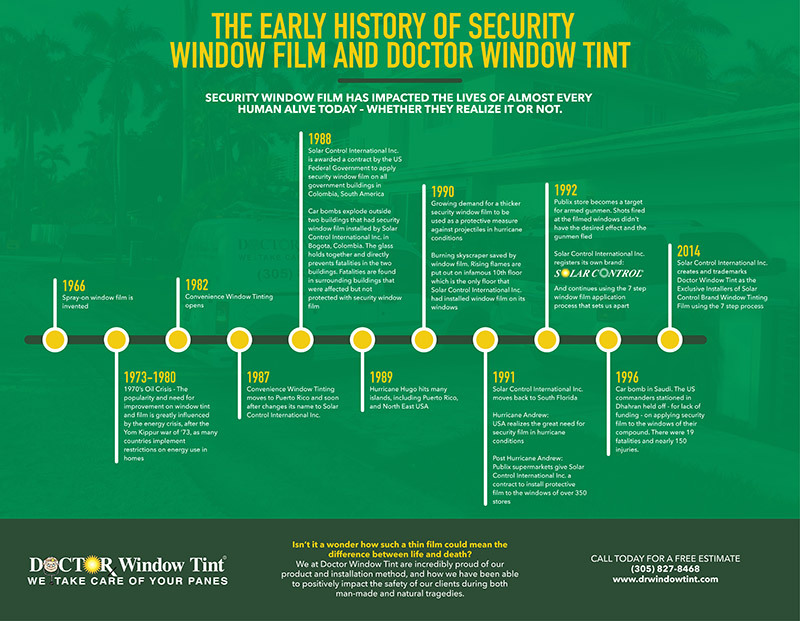 Join us as we take you through this history of the incredible innovation of security window film which has impacted the lives of almost every human alive today – whether they realize it or not. You might not automatically place the term “security window film” in the same sentence as the phrase “war on terrorism”, but it’s true – there is quite a connection. From its creation in the ‘60’s, not too many years before the beginnings of our company in the ‘80’s, there have been numerous incidences that link window film installation to that of protection against all kinds of threats. Today, protective window film installation is a security measure that is advised for all buildings occupied by American forces. The story of how we got there is an interesting one. Window tint made its first appearance on select vehicles post World War I in the ‘50’s and was an instant hit. So much so that many took to using an at home spray on version of a tint on their own vehicles. It wasn’t quite the product we have today. Eventually, the product became available for homes and larger windows. This may have its roots in the growing belief that shading and curtaining didn’t actually make a room cooler. The popularity and need for improvement on window tint and film seems to have been greatly influenced by the energy crisis of the ‘70’s, after the Yom Kippur war of ’73, as many countries implemented restrictions on energy use in homes. Being told you can only heat or cool one room in your house might have the effect of prompting people to find resourceful ways of doing this without using actual energy. Humankind is phenomenal that way. Thus began the realization of window film’s first major benefit outside of just being cool – pun intended. This takes us to the starting point of our very own story and how we have been involved in the acknowledgement and use of window film’s major secondary benefit. Once window film became more widely used it simultaneously became apparent that it also went a long way in holding glass together under impact and pressure. Our company started as Convenience Window Tinting in 1982, and then the company name changed to Solar Control International (S.C.I.) Inc. in 1987. In 1992 S.C.I. Inc. registers its own brand of window film as SOLARCONTROL® brand. This is not a sidebar. After our start in South Florida in 1982, the company shortly made its way to Puerto Rico just before the tragedy of Hurricane Hugo hit. We learned that window film wasn’t just about convenience. The demand grew for security window film, a thicker film, as a protective measure against projectiles in hurricane conditions. When we reregistered in 1992 under our new name, there was more than just one reason for doing so – we officially developed a 7-step window film application process for the best possible installation with the highest possible benefits. The fact of the matter was that we realized there was a dire issue with the low-quality of window film installation available industry-wide and we NEEDED to create a process that ensured a standard of window film application. The culmination of this process took place with the birth of Doctor Window Tint in 2014 as a registered service mark and the exclusive installers of the SOLARCONTROL® brand window tinting film. Traditionally the tinting industry has paid their tint installers by the square foot or by the car. This incentivizes the installers to go as fast as possible and results in a poor application that bubbled up. Our 7-step application process was specifically developed to combat bad installation while still creating an efficient and speedy application process. This process has stayed with us through the development of new products and materials, such as ceramic film, because it works. The 7 steps involve applying, squeegeeing, and most importantly – two pauses. During the two pauses, the water molecules pull themselves together into tiny pools which are easy to push out from underneath the film. One major risk in window film application is that it doesn’t adhere to the glass well enough and when water is left under the film at installation, it evaporates leaving behind the airspace which is where bubbles in your window tint come from. Our unique 7-step process makes sure that the least amount of possible moisture (less than 10%) stays behind to interfere with the film’s adhesion to the glass. So, while it may have been a “stormy” start for both security window film and Doctor Window Tint, it was nothing on what was to come. A momentary return to the ‘80’s gives another tremendous example of how security window film became entwined with the idea of safety under certain extreme conditions. This was a time of great activity in the war against drugs, and we were awarded a contract by the US Federal Government to apply security window film on all government buildings in Colombia, South America. This was in ’88, before two car bombs exploded right outside two buildings that had been upgraded with our security window film. The glass held together and directly prevented fatalities in those two buildings. In surrounding buildings that were affected, there were fatalities. To prevent any disbelief at just what the right security window film, installed the right way, can do for safety we must tell a different story. One of a car bomb in Saudi Arabia. The US commanders stationed in Dhahran held off on applying security film to the windows of their compound. This was in 1996, quite some time after the protective properties of security window film had been established and the product was being highly recommended for buildings such as theirs. There were 19 fatalities and nearly 150 injuries. Glass from a blast is known to be the highest contributor to injuries, and articles reporting on the Saudi bombing described the windows shattering and the walls gave way. This incident was a car bomb, just like the ones in Bogota, Colombia. A sad fact is that the reason for the delay was the expense. Money is a funny thing – we often let the amount in dollars overshadow the greater potential loss. So, our time in South America showed us the extensive benefits of using security window film as a protective force (with hurricanes and bombings on the list) and contributed to the product and process we registered when moving back to South Florida in ’91. Just in time for Hurricane Andrew. It was America’s turn to see the great need for this security film. Publix supermarkets were quick on the uptake, giving us a contract to install protective film to the windows of over 350 of their stores after they witnessed the major difference the product made where it had been installed before the Hurricane Andrew hit. They went on to experience the benefits of our product outside of extreme hurricane conditions when a year later one of their stores became a target for armed gunmen. Shots fired at the filmed windows didn’t have the desired effect and the gunmen fled. Publix awarded us with a plaque of thanks because the way they saw it, people could have lost their lives that night. Another such incident occurred when a skyscraper building had our tint applied to the entire tenth floor by the occupants of that floor. There was actually quite a bit of tension around how it affected the appearance of the building – “it made the skyscraper look like a giant finger with a silver ring on the 10th floor”. This tension continued up to the day that a fire broke out in the basement and burned up through the building until, upon reaching infamous floor number ten, the contested film on the windows of that floor stifled the oxygen supply and suppressed the flames, putting out the fire completely. The more general significance of the ‘90s for window film is that this is when the technology advanced to include metallic compounds, which assist in heat reduction. This, in addition to the thickness and additional adhesive of the window film, made it stronger and more resistant to heat, light, and impact. It has since become synonymous with curbing crime related injuries. We have focused on hurricanes, fires, bombs, and burglary attempts. Cast your mind further to include earthquakes, car accidents, food production buildings – flying glass and broken shards of glass are major concerns in all these situations. Security window film holds those shards together, even if the glass is shattered, and many injuries and possible hazards are avoided altogether. The generation of film that relied on metal particles was further advanced when ceramic film was designed. The strength, lifespan, and benefits of this latest product are immeasurably greater. Many of the downsides of metal based window film have been corrected with this product. Before ceramic technology, heat reduction relied on darker tints which inevitably reduced the view in through the windows. Ceramic window film allows for incredible heat reduction by inhibiting the InfraRed (IR) portion of the light spectrum. Therefore, it does not require the dark shading of tints to lessen heat, meaning you can now enjoy great heat reduction without darkening the room. It doesn’t interfere with the view or tone of windows or electronic devices. Ceramic film has changed an already spectacular game. It goes without saying that the window film you select will be determined by your needs; but even before developments, the installation of film by the 7-step process had proved itself under pressure. We at Doctor Window Tint are incredibly proud of our products and installation method, and how they have been able to positively impact the safety of our clients during both man-made and natural tragedies.